The Team provides a comprehensive introduction to group process. It is a must for any professional or leader who desires an understanding of task accomplishment through teamwork. The core of The Team is an integration of a series of models and theories to understand the dynamics of change and how a team approach can influence the change process. 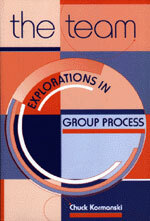 The text looks at the development of current theory by examining the philosophical underpinnings of group process and theory. You'll find chapters covering group development stages, change, conflict, leadership style, team building, diversity, applications and much, much more. The pragmatic approach of the book makes each concept and theory easy to understand.